Jenie Gao is the lead artist of this project. She is a storyteller at heart and her work consists of large-scale woodcuts and ink drawings that are high in contrast, selective in color, and steeped in metaphor. She’s the daughter of Chinese immigrants and grew up in semi-rural Kansas, which is likely what made her a mix of philosophical old soul and overly optimistic American. Read Jenie’s Migration Story here. Gabriela (Chanchita) Riveros is an illustrator/designer and a graduate from the Milwaukee Institute of Art & Design. She’s a Paraguayan-American who takes inspiration from the past and her heritage, as evidenced by her colorful, striking illustrations based on Latin American culture, art history, and literature. Read Gabriela’s Migration Story here. Gabi and Jenie worked on the mural with the students of Escuela Verde. 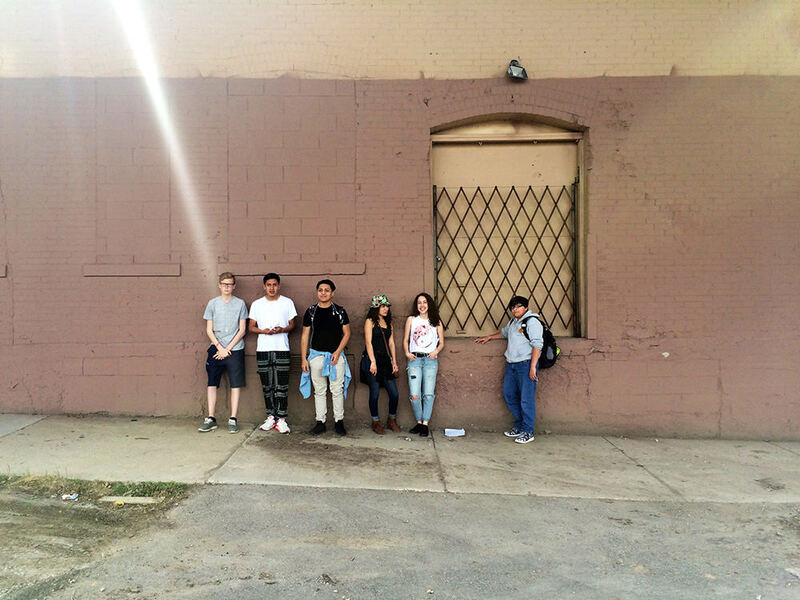 They created a series of workshops that focused on the arts and activism (from art history to street art to social media/the digital age), artistic techniques & skill-building, and research on immigration and our neighborhood. Together with students and community members, they created and painted the mural that will now live at 35th and Pierce Street, for all of our neighbors to enjoy. Artists Working in Education is a nonprofit whose mission is to provide youth with arts enrichment programs that advance learning, enhance human potential, and cultivate community. They partner with artists and schools to develop creative community design solutions that reflect the values and concerns of the neighborhoods where we work. This mural is a part of A.W.E.’s 5 x 3 Youth Led Community Design, the goal of which is to create 5 collaborative public works in 5 neighborhoods. We use the arts as a way to identify and address issues that matter to our communities, to reach a wider audience and converse with key decision makers. We emphasize researching and understanding these neighborhoods and aligning in our goals on how to beautify our public spaces and make them more inclusive. Escuela Verde is a public charter school in Milwaukee, Wisconsin, authorized by the Common Council of the City of Milwaukee, operated by TransCenter for Youth. They use the EdVisions Project-Based Learning model design their programming to support students interested in sustainability, student-led learning, and restorative justice. The program is funded by: The Greater Milwaukee Foundation’s Racial Equity and Inclusion Grant and the Herzfeld Foundation. Some of the students of Escuela Verde who participated in our workshops and collaborated with us on the mural.